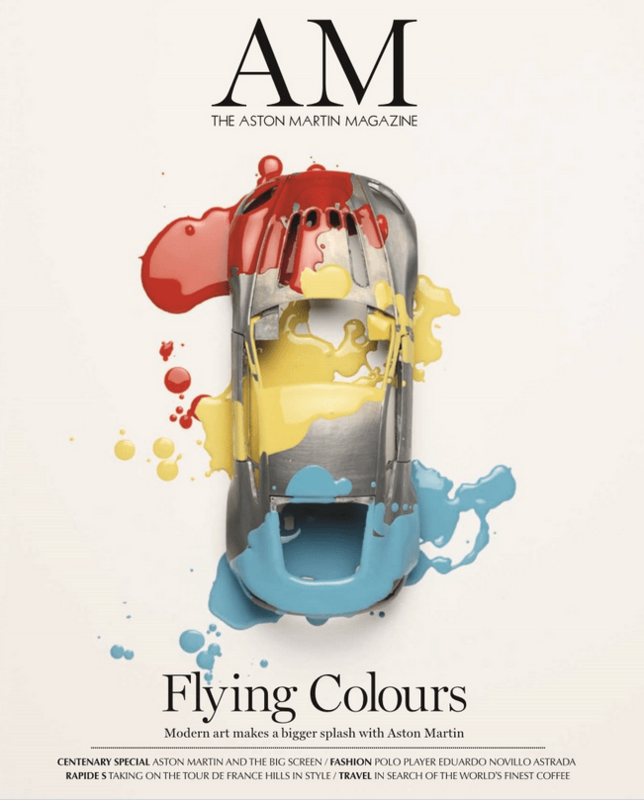 A few months ago ‘AM’ the Aston Martin magazine went through a comprehensive relaunch with a fresh new design, publishing and editorial team. Alongside this I’ve worked with our publisher to create an all new iPad app and also integrate the magazine within the main Aston Martin website. We’ve done this in two ways; firstly creating a full digital magazine – great design and interface here, and secondly then embedding certain articles within relevant product and content sections, such as our James Bond & Aston Martin feature. I’ve always wanted to use the rich, creative and inspiring content produced within our magazine throughout the rest of the site to augment and complement product stories, early days but the signs are good with a great design and easy interface, plus fantastic, compelling copy from our team. Three weeks ago Aston Martin unveiled its new flagship model – Vanquish. The digital launch strategy for this is something that has been planned for over six months, we’ve received great feedback and have seen some fantastic stats that back up the effectiveness of what we’ve done. The press release issued by our Brand Communications department with my quotes can be seen below, I will expand this post at a later date with my views on the strategy itself and what we did and why we did it…. 27 June 2012 – The new Aston Martin Vanquish is already breaking records, just a week after making its world debut at WWW.ASTONMARTIN.COM. Unprecedented global interest in Aston Martin’s new hero means the luxury British brand is rewriting its internet record books. Wednesday, Thursday and Friday last week – June 20, 21 and 22 – saw the three highest traffic days ever recorded on Aston Martin’s global website: WWW.ASTONMARTIN.COM as eager car fans around the world flocked to find out more about the stunning new V12-engined super grand tourer. The brand’s experienced digital communications team has been watching the records tumble as users flock to the new Vanquish web pages, with more than double the daily average number of visitors to the site over the past seven days. Friday’s traffic was driven higher still by a large number of automotive news websites worldwide, including TopGear.com here in the UK, linking to the impressive new VANQUISH CONFIGURATOR. In fact the TopGear story on the Vanquish was its most popular of the month in terms of views. As for global interest, the growth in selected markets against the same period seven days earlier is just as exceptional with, for instance, visits to the site from the United States soaring by 102%. Closer to home, visits from the UK were up 162% while Germans, too, have been racing to grab a glimpse of the new car – visits to the Aston Martin site from that country soared by 216%. In China, where Aston Martin is still a relative newcomer, interest has been shooting up with visits to the site jumping 81%. THE VANQUISH LAUNCH FILM – is currently standing at almost 200,000 views since Wednesday 20 June making it, comfortably, the fastest-growing video the Gaydon-based luxury sports car maker has ever produced. On Thursday last week the film ‘charted’ among the top 50 YouTube videos worldwide. Currently, the Vanquish launch film sits second behind a One-77 video as the most widely viewed of the 150 video shorts Aston Martin currently offers on its YouTube channelHTTP://YOUTUBE.COM/ASTONMARTIN however all the signs are that the Vanquish will quickly overtake even its £1.2m hypercar sibling in the Aston Martin range when it comes to views online. The film also helped the brand accelerate past three million YouTube video views in total. The social networking phenomenon Facebook has also played its part in the remarkable story of new Vanquish. Aston Martin has released one image of the new car per day and the Vanquish picture posted on Friday is the most popular the brand has ever published, with more than 24,000 ‘likes’ thus far. Wednesday, the day of the new sports car’s official global debut, also saw Aston Martin add another 4,000 new ‘likes’ for its Facebook page, another new record since Facebook restructured its page promotion. The brand is now proud to boast more than 1.7m Facebook fans worldwide. Finally, Twitter has also been playing its part in spreading the Vanquish message through cyberspace. The hashtag ‘#Vanquish’ as well as the phrase ‘Aston Martin Vanquish’ were top trending in the UK on Wednesday, while #Vanquish also briefly trended in the significantly more populous Twittersphere of the United States late on Wednesday afternoon. This helped double the sports car maker’s follower rate through Wednesday, Thursday and Friday – with Aston Martin now being followed by almost 33,000 eager ‘Tweeters’. Pete Norwood is Digital Marketing Communications Manager at Aston Martin. He said: “The unprecedented interest we’re already seeing in the spectacular new Vanquish from around the world is, I think, a very clear indicator of how exciting our new sports car is. We’ve been building up to this release for a while, it’s finally here and it looks fantastic!